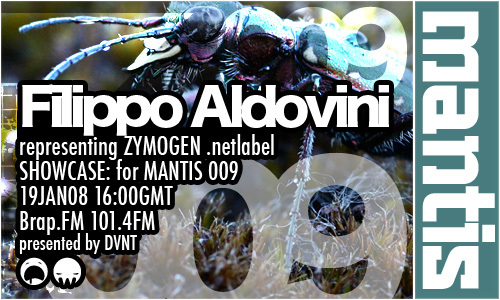 Mantis Radio presents Filippo Aldovini, head of netaudio label Zymogen.net with a session compiled of ambient, dowmtempo, abstract lush sound. Zymogen offers a means to consider and experience distinct electronic music and the internet as a resource. It is the product of refined consideration for experimental expression and aesthetics, offering music in a digital format since September 2005. Zymogen’s foremost objective is to create a personal touch, in order to draw attention and stand out in the multitude. The supporting sounds on offer as mixed by DVNT included the forthcoming r3tox Recordings release from The Divide with I Lift It, new Breakbeat Buddha, Jnr Hacksaw and Kilowatts. He also revisited a few classics, including Apex, General Midi< and Human Resource’s mighty Dominator.